Balaji Sabhagriha & Prarthana Mandir has Wooden Mantap which has been untouched since the formation of “Balaji Seva Samiti” in 1993, except for a few coats of varnish. The idea of adorning Mantap inside Garbhagudi was mooted long back during a formal disccussion on some occassion. A firm decision was taken (by votes) during the recently concluded “Annual General Body” meeting held on first Sunday of January 2011, to adorn the entire wooden mantap with “Brass” and to adorn the Sandal Wood idol of Lord Balaji which was installed by the august hands of Parama Poojya Srimad Sudhindhra Teertha Swamiji of Kashimutt Saunsthan with “Silver Prabhavali”. The design and execution of the embossing work has been entrusted to the renowned jewelllers M/S AIRODY JEWELLERS (Sri. Airody Ananth Pai of Udupi) who has a GOOD experience in this field. The total cost of this project is estimated to be arround Rs.2.5 lakhs. 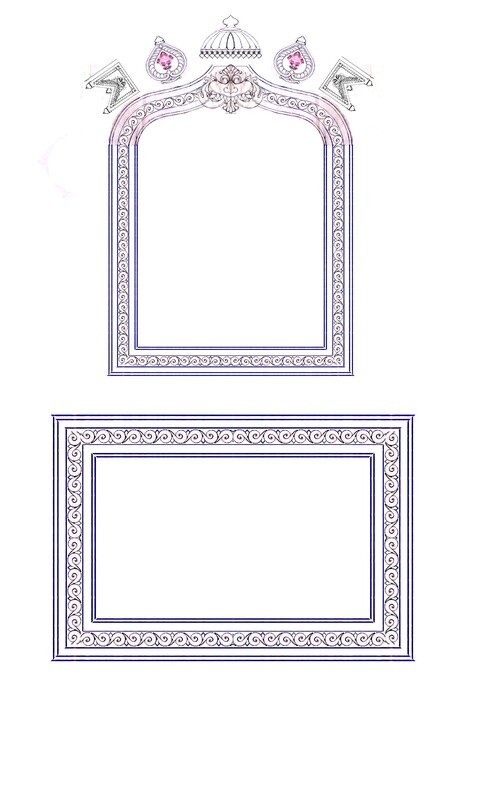 The sketch of the “Siver Prabhavali” and the “Frame” for the Swamiji’s photo is shown above.